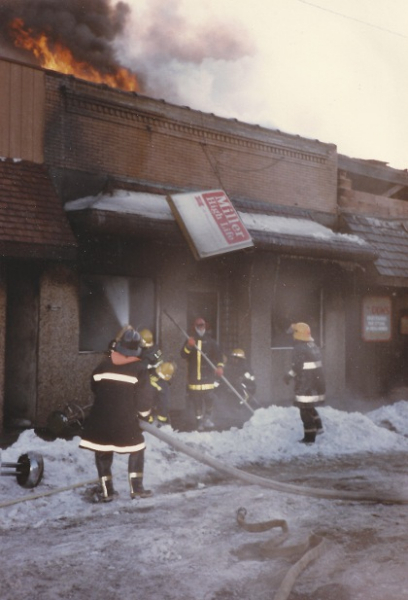 Ladd – Fire destroyed Ripp´s Tavern, 311 N. Main St., Ladd, today. Don´s Hair Styling shop, an adjunct to the tavern, was heavily damaged by fire and smoke. 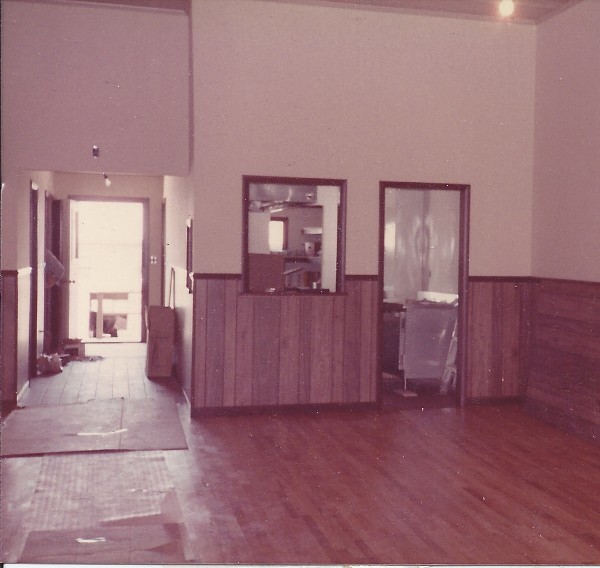 Smoke damage was caused to an apartment north of the tavern occupied by Mr. and Mrs. Robert Mitchell; to the office of Richard Fiocchi, attorney, and to two south apartments occupied by Jeanie Joiner and Jack Manning. The fire started at 6 a.m. It was under control at 8:30 a.m., but still burning. 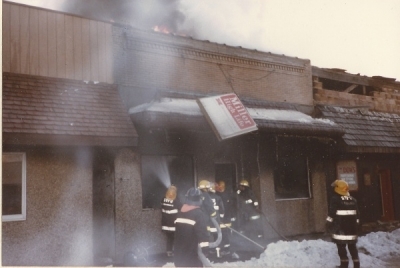 The firemen were expected to be at the site the rest of the day, according to Fire Chief William Liebe Jr.
Leno Lanzi, who lives across the alley from the tavern, and Frank Margherio, cook at the tavern, noticed flames between the wall and floor when they moved garbage cans away from the back of the building, according to Mrs. Lanzi. Lanzi had noticed the garbage burning and notified Margherio. 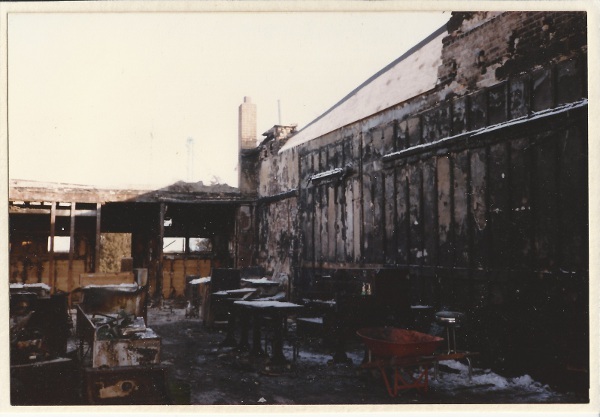 By then, the building was full of smoke. Ripp´s Tavern was owned by William M. Rounds, Rickard Grivetti, and William C. Rounds. 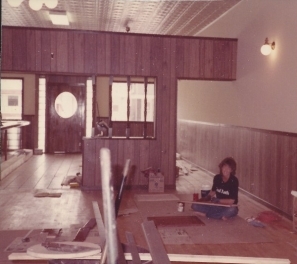 Debbie Bickett, an employee, recently purchased Don´s Styling Shop. Seatonville and Spring Valley Fire departments were called to assist. Two 1033 Ambulances were on hand. Traffic was directed by deputies of the Bureau County Sheriff´s Department. Those words will sound forever in my ears. What will life be like without Rip´s? To those few wayward or uneducated newcomers, Rip´s was an Institution in the Illinois Valley. It´s been that way for as long as anyone I know can remember. To stand in line for an hour or more in freezing temperatures to be served friend chicken on a paper plate and no fork was the high poing of many a weekend for at least two generations, maybe more. Playing Rip´s bowling machine was a treat, too. For the past few years, the mechanism hasn´t been what it used to be, but playing it was just as much fun as ever. It was a Tradition. 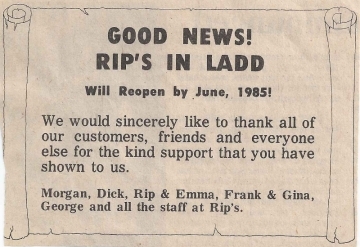 I remember my introduction to Rip´s. 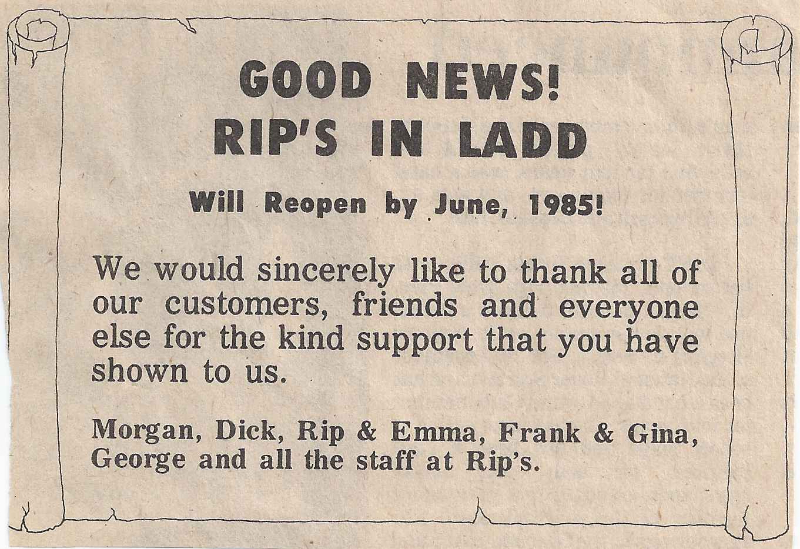 While living in Waukegan, I met some people who couldn´t wait to take me to Ladd for chicken at Rip´s. Go to where and have chicken? “You´ve got to have Rip´s chicken!” they insisted. “You´ve got to play the bowling machine!” they screamed. And they wouldn´t take no for an answer. And so continued the Tradition. My friends were right, of course. Rip´s was the place you had to go. 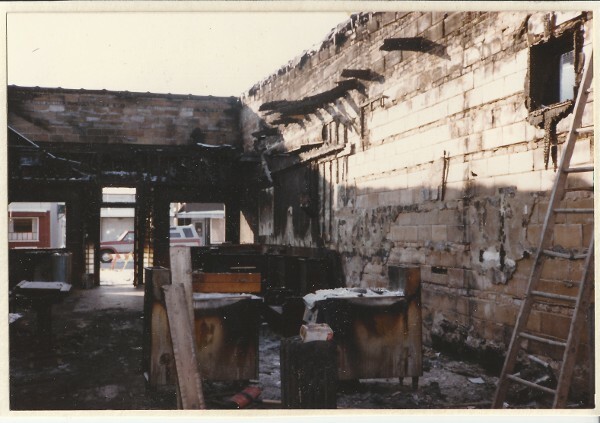 We lived in Waukegan, but we came to Rip´s. We moved to Bloomington, but we still came to Rip´s. Then when we moved to Mendota, we found that we took it for granted … we thought it would always be there.